The Wash It Laundry Ball cleans your laundry without the need for soap or detergent. It also eliminates the need for softeners and makes washing clothes easier than ever. Just throw it in your washing machine and you are good to go for up to 100 loads. It is a pure, hypoallergenic way to wash clothes that is safe for the most sensitive skin, as well as babies and infants. Each laundry ball contains solid spheres that react with water on contact and create a molecular ionization process. When they are in the machine, the balls produce ionized oxygen and increase the pH level of the water. This makes the molecules more efficient, and allows the ionized oxygen to penetrate through the fibers of your clothing, and remove the dirt. Basically it has everything needed to clean, but doesn't contain any of the harmful and unnecessary additives. This environmentally friendly detergent ball is a pure way to wash your clothing and is safe for the most delicate fabrics. Your garments will be left clean, residue free and smelling fresh. Wash up to 100 Loads with just one ball. This innovative laundry ball makes doing laundry easier than ever, and eliminates all of the harmful chemicals. It is great for people with sensitive skin, washing children's clothes, people who live in dorms and apartments, or anyone else interested in an easy to use, hypoallergenic laundry solution. Stop lugging around huge jugs of liquid detergent, or measuring and pouring for each load. Discover a simple and environmentally friendly way to clean your clothes. The Wash It ball is powerful, foamless, fresh, reusable, detergent free, soap free, harsh chemical free, and doesn't contain Phosphorus, Boron, ABS, LAS or SAS. It is safe to use on any fabric, and will never ruin or fade colors. Your clothes won't be saturated with perfumes, but they will smell clean and fresh after washing them with this ball. Once dropped into the water, the Wash It Laundry Ball releases its active ingredients with constant speed during the wash and rinse cycles. The Wash-It ball activates the water molecules for an ion exchange, producing electrolytic oxygen and hydroxide ions. The electrolytic oxygen is a pure, natural cleanser which is absorbed between the stain and fiber reducing the adhesive force of the stain. The stain is actually separated from the fiber with the activated water molecules, then emulsified and dispersed into the water. The activated ions remain on the fiber, enabling it to resist the re-deposit of stains on the surface. The chemical reaction is completely safe, gentle and results in a pure, clean, hypo­allergenic wash. The Wash It laundry ball does not contain soaps, harmful chemicals, phos­phates, EDTA, NTA or boron compounds. This laundry ball meets all environmental protection criteria which means that it is safe for you and your planet. Now you can have clean, fresh, odor-free laundry without irritation. Order Yours Today! Ball Dimensions 1.75" x 2.25"
Wash It Laundry Ball - An all-natural alternative to laundry soap. It is free of harsh chemicals, and safe for people with allergies. 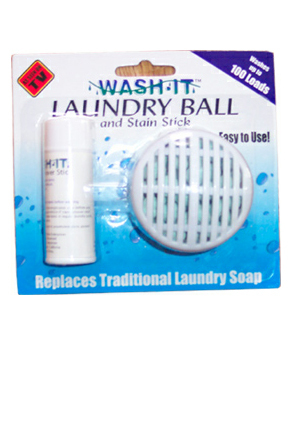 Wash your clothes without toxic chemicals.Wash up to 100 Loads with this amazing laundry ball. I have used it a couple of times but I can't say for sure how well it is working. Maybe I am a creature of habit in seeing suds in the water so I am not sure I owuld keep using it. Love the laundry ball works great! I love laundry balls. They clean as well as any laundry detergent and I don't have to carry heavy bottles or boxes. I also don't have to worry about spillage. I've been using these for years, and have saved a lot of money by not using detergents which eventually cause problems. Many of my friends and family are now using this prodect or are interested in trying it. I have used them before, I love them. Great to take travelling because you don't have to take forever to rinse out soap. And they take up such a small amount of space in your suitcase. I'm glad to see you these balls; I've used them for years. They do what they say. You can stretch their use farther by saving them when the pellets get really small. When the next one gets small, just add them together. One caution: I thought if a little was good a lot would be a lot better. I found that they are so efficient that it is possible to remove the natural oils from natural fabrics if used in too great quantity or for too long a wash. One really nice thing is that I found that they will take the mildew smell out of fabric that has been damp too long.Users: when you use them and find that they do what they are supposed to, please spread the word so the company doesn't go out of business for lack of sufficient repeat business. Sooner or later, we will need them again, and we want to still be able to find them! This is a wonderful product. I have been using the Wash It Balls since 2000. I have very sensitive skin and used to itch and break out in a rash due to laundry products. Not any more thanks to the Wash It Balls. No More rash, No more itching, just clean clothes. Thank you so very much. These have been a great help as for as we have not had any clogged drains since we started using these. Can the Wash It Laundry Ball be used in a front load HE washer? Will it cause any damage? I read it works with the water and ionizing so if there is less water in the wash will they work as efficiently? It will not cause damage, but it is intended for use with more water. The low water and increased agitation will not prevent it from working, but it may require slight modification for best results. Many customers have success when using them in a bag because it will contain any broken pieces that sneak out of the ball. The soap is in the pellets, so they do need to get wet in order to work. 4 of 8 Customer(s) found this Answer helpful. could this ball replace the chemicals for a personal spa/hottub? We have never tested it, but this may be possible. The pellets would slowly dissolve, but we could not say whether they would serve the same purpose.